We purchased a Splendide 7100xc washer dryer combo February 2, 2017. Our Dometic combo unit had the control panel go out on it so since Dometic doesn’t make the units anymore and they didn’t have a replacement part, they agreed to get us one of our choice. The mobile tech we hired in Minnesota said nothing but good things about the Splendide and installed a brand new unit for us. I read through the manual thoroughly even though we’d had a ventless combo for 2 years already. We did 2 loads of clothes then headed for the next job in Ohio. When we arrived on the 6th of February, the Splendide started throwing an F13 error code. I tried following the instructions in the manual (flipping the breaker off for 40 seconds to reboot the machine) but we were still getting the code. I called Splendide customer service and they walked me through how to “clean the condenser” because they thought possibly it was clogged. After two loads of clothes, I highly doubted this, but I gave it a shot. It worked great for another two cycles then threw the code again. Since we are originally from Ohio, I was at my mom’s visiting while Allen was working about an hour away. He didn’t have time to call customer service or mess with it while he was working so we let it go until I got back home. We left for Kansas and as soon as we got there I called customer service again. They said they could walk us through how to test the machine with a volt meter (since we couldn’t find a mobile tech to come near it in Wichita). We had to wait until Allen got a weather day and was home during Splendide business hours to pull it out of the closet and test it. Everything tested normal. They then told us how to take the back panel off, remove the condenser and filter, and clean it. The condenser was spotless but the plastic filter was covered in a white cake like residue. Darrel at Splendide told me it’s most likely from our fabric softener. I was using a TBSP in each load per the instructions in the manual but he suggested I replace it with vinegar. So now our laundry routine consisted of 1-2TBSP of Tide HE and 1TBSP of vinegar. We did great laundry for a week. Then came the code yet again. This time when I called customer service I spoke with Lad. I explained our prior calls and issues and he said it had to be from our laundry soap. He had me run the cleaning the condenser cycle again and sent me a box of Splendide brand laundry soap that we were to use from now on in place of the Tide. 2 loads after the new routine we got the error code again. Another call to customer service and Lad had me check the fan. I tricked the door into thinking it was closed and ran a dry cycle in the machine. He decided to send us a new fan to replace the original. He also emailed me an instruction manual that the techs use for how to do this. He suggested we also clean the plastic filter again while we have the machine apart. Now, we aren’t mobile techs, but we can DIY things when we have to. The washer is 160lbs, in a cubby in the front closet of our bedroom. It’s not easy to pull out and get back in. Replacing the fan and cleaning the filter took close to 3 hours from start to finish. We were getting quite sick of working on this brand new machine at that point. 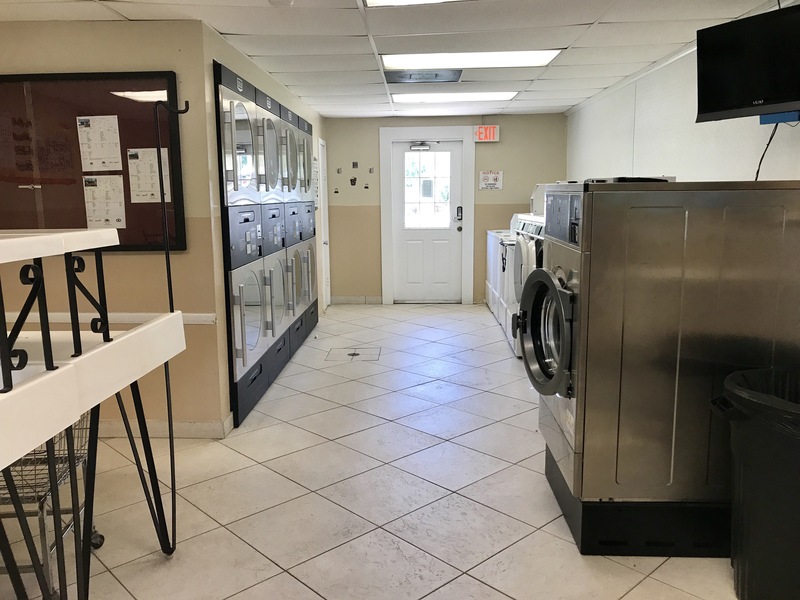 We did really great laundry for about 2 weeks after we were finished and were hoping beyond what we actually expected that this was fixed and we wouldn’t have anymore problems. We spent a few days in Indiana then drove down to St. Augustine for a weekend job. That’s when we got the code again. We left St. Augustine for Tampa on a Monday. And when we got settled I called Lad again, now we could recognize each others voices! I explained what was going on and he said he would contact the higher ups and tell them I wanted a new machine or a refund. I got a call back in a couple hours saying the higher ups wanted to send me a new black plastic filter to replace the white one that kept clogging (from fabric softener or Tide or now vinegar or Splendide soap). That wasn’t all. They wanted me to buy Affresh washing machine drum cleaner and use it once a week. My name is Rachel Gillen. My boyfriend, Allen Barrow, and I purchased a Splendide 7100xc on February 2, 2017. Since week one, we have had nothing but problems with it. It’s been throwing the F13 error code intermittently since we started using it. 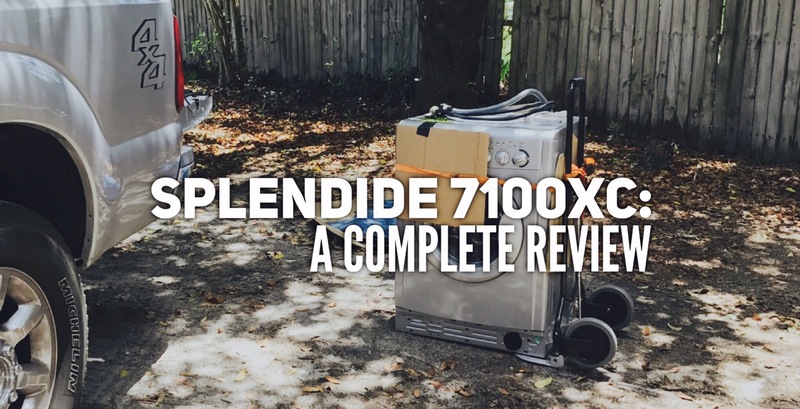 Let me start with the reason we decided on a Splendide 7100xc, if you will. When we purchased our new camper back in March of 2015, there was a washer/dryer hookup so we went with a Dometic ventless combo unit and had it installed at the dealer. In January of 2015 it started s throwing an error code. We had a mobile tech come out and he discovered that the control panel was shot. Dometic has stopped making the ventless combo units and they didn’t have a replacement panel to send us. So they offered to replace our unit with another of our choosing. This was on February 1, 2017. After talking with the mobile tech, we decided on a Splendide 7100xc. He told us he rarely gets service calls about them, Splendide is great with customer service, etc. We wanted to stay with a ventless because that’s what we’ve grown accustomed to. I’ve always used Tide HE and Suavitel Fast Dry fabric softener with all of our laundry. We used the unit for maybe 2 loads of clothes then we left Minnesota and headed to Dayton, Ohio. When we got to Ohio a couple days later, I tried to do a load of clothes and that’s when the error code came up. I looked in the manual and checked online, then I finally called the service number. The tech told me to run the clean out cycle 3 times. (Fill with water then run the wool cycle to slosh water around vigorously up into the condenser to rinse it out). He said the condenser was probably clogged. I explained that this was a brand new unit, that all of our clothes are well worn, I didn’t wash anything brand new or super fuzzy. But I did that and it was good for about 2 loads then the code came back on. I left to go stay with my mother for about 2.5 weeks so we didn’t touch it, didn’t call about it, just let it be. When I got back, I tried running the clean cycle again but it didn’t help. We left for Wichita, KS and when we got settled there I called the service number again. They told me to call a mobile tech to come out and check it out. There is ONE mobile tech in Wichita and he does not work on washers and dryers! So I called back. This time I spoke with Darryl. He said as long as we could get a capable person in front of the thing, they could walk us through diagnosing the problem over the phone. So about a week went by before my boyfriend was actually home from work during west coast business hours and could pull this heavy thing out of the closet nook in our fifth wheel. We tested everything with a volt meter and it was good. Then he had us take the condenser off (perfectly clean) and check the filter on the back. That is not easy to get to or easy to put back on. But it was caked up with white residue. We scraped it off and cleaned it thoroughly then replaced everything. Darryl suggested that instead of using a tbsp of fabric softener (because he thought that’s what caused the build up of residue) that we use vinegar instead. Just a tablespoon. I was okay with this, as long as it would work. That was fine for close to a week then the same code came up. This is when I talked to Lad. He sent us a box of Splendide soap to use because at this point it had to be my Tide HE that was clogging the filter. I ran that cleaning cycle again a few times then started only using 1/3 scoop of Splendide soap and a tbsp of vinegar. So after 3 loads of the Splendide soap and vinegar routine we got the same code again! This time Lad walked me through tricking the door into thinking it was closed to check the airflow. Lad sent me a new fan. So we took it out of the closet, replaced the fan and cleaned the filter AGAIN, which was clogged even worse than the first time in a matter of maybe 2 weeks. 3 hours later we got everything back together and it was fine for about 2 weeks. Then it started throwing the code. This unit is 3 months old today. I talked to Lad again yesterday and he said now they want to send me a new filter to replace the original. AND I now have to use a separate product called Affresh once a week to clean the drum of the machine. The ENTIRE time we had our Dometic washer/dryer ventless combo unit, never once did I have to clean the drum. Never once did we have to clean a filter, let alone replace it. We never had to replace the fan (which wasn’t the problem with this one it turns out anyway). I could use whatever laundry soap I wanted, I wasn’t forced to use the manufacturers brand of soap. I could use fabric softener on my clothes so they smell good, I didn’t have to use vinegar. I never had to run a “cleaning cycle” that wasn’t mentioned in the manual even once. With this Splendide combo I’ve had to run that cycle too many times to count. I’m a quarter of the way through our so called one year warranty and I’ve gotten maybe 4 weeks of laundry done properly. I have an entire bottle of unused Tide HE and a bottle of Suavitel fabric softener. A box of Splendide laundry soap. A bottle of white vinegar. And now I’m supposed to buy another product called Affresh and use that once a week. AFTER we replace the filter we’ve cleaned out twice. We live full time in our camper and travel for my boyfriend’s work. We move frequently. He works on average 10-11hrs a day, 6 days a week. This unit is too heavy for me to pull out and access the back panel by myself. It’s almost too much for him to do alone. And forget trying to get that filter off without an extra set of hands. I don’t mind doing things ourselves, but this is too much. We’ve had to pull this thing out of the closet twice now, three times if you count when the filter didn’t get put on exactly right and leaked water all over the shelf and closet floor before we caught it. Lad told me about the tests you’ve been doing in the warehouse with a load of brand new towels and how you measure them after each cycle to determine if the machine is still drying properly. That’s great. But that’s not a real world test. I don’t wash the same clean towels over and over again. I wash our clothes that we wear daily, just like you do. We don’t have brand new clothing. We don’t have anything that’s exceptionally “linty”. I don’t overload the machine. I don’t use too much soap or softener (none now). I’m not complaining that my clothes are a little damp when they come out, I’m used to that. I’ve had a ventless combo for over 2 years now and I understand how they work. Lad mentioned in a prior conversation that we may need to send the unit to Elkhart for testing or fixing. He said you’d send me packing material and send a truck to pick it up. We can’t get this thing out by ourselves and pack it in a box. I don’t want to have to jump through all these hoops just to do my laundry. And if I knew that I would have to, I never would’ve opted for a Splendide unit. We have a lemon of a washer. Something in the design of this particular unit is wrong. I want a new washer or I want my money back so I can get another brand. And I don’t want to have to pay a mobile tech to come out and do that. I shouldn’t have to. I paid a mobile tech to install it. Thank you for your time and I look forward to a prompt response with a reasonable resolution. Darrel, the vinegar guy, who I suppose is also the National Director of Service, called me a couple hours later. He still said it was something I was doing with my laundry because they couldn’t figure out where the white cake like substance was coming from. I’m not a baker, I don’t work with flour, I don’t roll around in cocaine then wash my clothes, so I don’t know where it was coming from either. He agreed to give us a full refund and send someone to pick up the machine. Lad said the check would go out Wednesday morning. I was waiting to post this until we actually received the money. I called our address service the following Tuesday to see if the check had come but it hadn’t so I gave Lad a call again. Oops, it was still sitting on his desk so he promised it would go in the mail immediately. It just got to us Saturday so here’s the post! Now we are searching for a new combo unit. Not a Splendide. I’ve called a couple RV dealers and have a few in mind but I am still doing some research. Most of the places have to order them, so we need to be somewhere long enough for that to happen. I did find Southern RV, and the owner, Jason, said he could get us a Pinnacle in a day. I tried calling Pinnacle to find out how they would deal with warranty issues but all the numbers go to a place called Appliance Desk. I can barely understand the people on the phone but they handle all warranties for Pinnacle, Deco and Equator brand combos. Same machine, different sticker on the front. I found a Haier combo at Lowes or Home Depot so I called them. They don’t work with customers directly. They call their own 3rd party warranty fixer companies and the one she told me for this area has terrible reviews online. I’m leaning toward ordering one from either Lowe’s or Home Depot because they offer their own extended warranties (with a no lemon policy) and they are actually IN the United States. The only other brand I’ve found is Magic Chef but I’ve yet to call and see about their company. So we’ll see how that pans out… I know for a fact I’m tired of lugging our laundry out and spending money to do it! We are in Orange City, Florida now, through maybe Tuesday or Wednesday then I believe we are going somewhere in Arkansas, but that’s yet to be finalized. This entry was posted in 2015 Grand Design Momentum 385TH, Camper, RV and tagged 7100xc, all in one washer, appliance desk, combo washer dryer, deco, Dometic, equator, lemon, Magic Chef, pinnacle, refund, rv laundry, rv problems, southern rv, splendide, splendide fan replacement, splendide ventless combo, troubleshooting, warranty by Rachel Gillen. Bookmark the permalink. dirty work for us on this! Hopefully next one wont be such a lemon! Remember to go cool off in Blue Springs! It’s beautiful there! I wish we were going to have time! I don’t think we will now… haven’t had a day off since last Sunday. Thank you for sharing your experience. I’m sure that I’m not the only learning from your misfortune. Thanks for the detailed update Rachel. It’s disheartening they had you do all those guess fixes on the new combo unit. I guess it is a good thing they finally took the unit back. Worst yet is having to research a new brand – which I’m looking forward to your decision. Wonder if a vented unit would have changed anything? I really have no idea on that, just wondering. I’m not sure really. Our Dometic never got clogged with anything and it was also ventless. I’ll be sure to update when we decide on something! Wow I was getting ready to delete the bookmark about the Dometic fiasco from way back only too see you had even more trouble yet again. Take it from me. Ever since I purchased a separate dryer (a small Panda one you can get on Amazon that will operate on 110V) the combination of that and the Midea (which I ended up using just as a washer) that situation has worked perfectly. 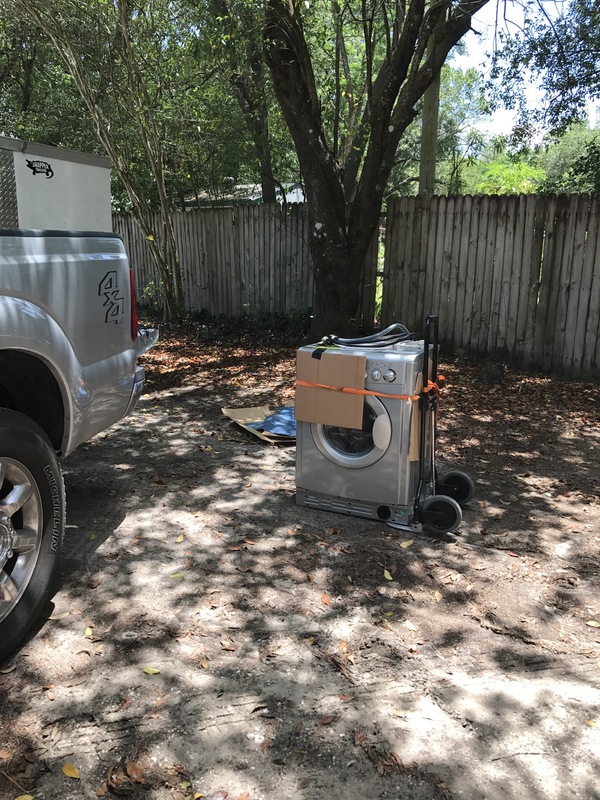 I think you are going to have to give up on combo units and just go for a portable washer and dryer. If you check around, none of the combo units get very good reviews. They are all junk, even the high end LGs. Check out the new post about the Edgestar combo we just purchased! We are loving it! Hi Duane, I’m really sorry to hear you’re having trouble. I suggest you call Splendide. They should be able to work with you. So which combo did you get looking for one now. Now we have an Edgestar ventless. So far it’s been pretty good. We’ve had it since July.